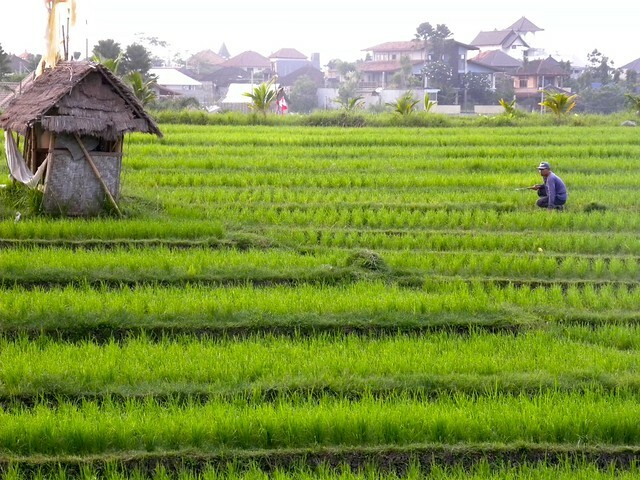 Just a few minutes' drive out of Seminyak, heading north towards Tanah Lot, you will find the laid-back area of Canggu, an area where you can still see lush rice fields and sleepy cows grazing next to the road. Canggu (pronounced "chan - goo") has become somewhat of a trendy place over recent years, with more and more expats and visiting surfers choosing to live in the rural setting between Kerobokan and Echo Beach. The area is made up of several beaches including Berawa, Batu Belig and Batu Bolong, and development seems to be going on everywhere at a rather rapid rate. Accommodation ranges from high-end luxury villas to the usual backpacker and surfer-style basic homestays, particularly along Jl. Batu Mejan. Many travelers also opt to stay in the Kuta-Legian-Seminyak area where there is a wider choice of accommodation and make the short drive in to Canggu for surf and sunsets. What the area does offer in spades is a number of cool, quirky and cosy places to hang out and grab a bite to eat or a cold beer. From rustic tree-house style cafes to hipster coffee houses and beachfront seafood restaurants, there's bound to be something for everyone in this part of Bali. Batu Bolong is a popular surf spot for both locals and expats, and is also the beach where the gorgeous Hotel Tugu Bali is located. Besides surfing, there's a Hindu temple on one side of the parking you could visit or there's the wonderfully relaxed Old Man's (named after the nearby surf spot) beachfront beer garden - a family friendly place that often has live music performances. Our personal favorites is Betelnut Cafe, a down-to-earth cafe overlooking the rice fields that serves some of the yummiest and healthy food we've tasted. Try one of their delicious smoothies, like the signature "Betelnut" made with red dragonfruit, banana, coconut and honey, or a slice of heavenly cheesecake after your surf. This black sand beach is one of Bali's most popular surf breaks and attracts surfers from all around the world. Pull up a bench at one of the beachfront restaurants and watch the guys and girls in the water or simply soak up the sunset views. For those still new to the sport, Canggu Surf School offers surf lessons for beginners as well as for children. They offer free pickup service in the Canggu area and guarantee one coach to every two students. Deus Ex Machina is another cool spot on the Canggu strip. If you're after custom motorcycles, hand made surfboads and skateboards, then this is the place for you. There's a mini ramp out back and their Sunday Sessions attract a fun crowd. Many people speed along Jl. Pantai Berawa on their way to Echo Beach without taking the time to discover all the hidden little cafes and restaurants that line this narrow road. Pop in at Bungalow for a healthy breakfast and a spot of shopping or pull up a chair at Butter Cake & Coffee Shop for a cup of coffee and a slice of decadent cake. You can't beat Swich when it comes to fresh and tasty sandwiches and wraps, and if you're feeling like something a little more exotic why not try Indotopia for something Vietnamese. If the beach is more your scene, it doesn't get much better than the VUE Beach Club at LV8 . Located right on Berawa Beach, the resort offers various accommodation options, two restaurants and a spa. 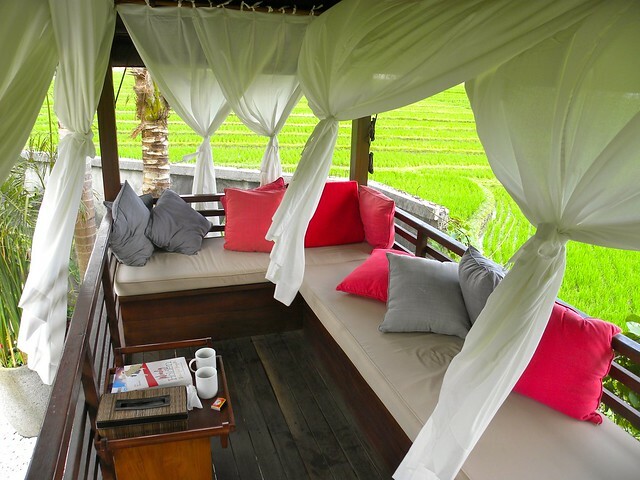 Then there's Desa Seni, a gorgeous eco village resort set in the rice fields. The resort offers unique accommodation in original antique wood homes that have been imported from all across Indonesia, however it's yoga that most people come here to do. Classes cater for all levels of experience and drop-in sessions are available from Rp. 140,000 per person. Most travel is by private car or motorcycle in this area, as taxis don't drive up and down the streets as they do in the busier tourist areas. A taxi from Seminyak to Canggu should cost around Rp. 70,000 . If you are staying in and around Canggu, it's recommended to book accommodation that includes a free airport transfer to avoid having to figure out how to get there once you have arrived in Bali.